Kathleen had suffered from anxiety, PTSD, bowel disease and repeated kidney infections and wanted to have a clearer understanding of her life purpose, and why she felt so anxious and disconnected from the world. She also spoke about being visited by aliens (Greys) in the night since childhood, and lucid dreaming and sleep paralysis were a regular occurrence for her. The scene begins dark then red, there was some intense light, and she felt emotional, then red with dark shapes including circles in fire and feelings of being really hot, like the fire was dancing all around her. She saw a beach and black rocks and the sky, she said; “The red teases me and feels heavy, it’s dancing, red flows through everything, I feel connected to it. The black rock is part of a volcano, and my feet feel nice in the water”. The scene turns white and she sees an eye, then the red again and tears as she said, “I do not want to be here”. “That’s really strong!” she said and became emotional, with the realisation of being the ocean. “I am not scared, I am part of it.” She saw sunshine rippling on the surface, it was a really nice temperature. She continued to observe the boats and the fisherman’s hooks from this perspective. “It’s relaxing and calm, it just is… It’s everything… I am the water, the Spirit of water.” She sighed. “Trees are above me. I feel One. It feels really nice.” (Becomes emotional again). She looked at an oak tree and smiled. She saw the tops of some old boats and the reflection of the trees. “This body is limitless I can’t feel pain because there is no receptacle because I feel so wonderful! I just am. There’s lots of movement, back and forth, up and down and around. I can see the fire again… This time I feel like I am blowing around the fire. We are working together” Then she blows out through her mouth. “Its like I can be anything. It’s getting lighter, energy, life is just flowing its just breathing, I am just here and it is so amazing. It’s not trying to command me and I’m not trying to command it. I see a wave of white light dancing around me. I still see the trees. I still see the orbs moving in the sky. I can be in the trees or just in the ground. It just feels really good, this is like my home… “ Said with tears of emotion. “A big bubble just went over me and moved me… There is something coming from the sky, dropping through the sky. It broke the clouds up and came through, I’m underneath it. It’s a red smoky sky and theres things dropping out of it. Things flying fast. I see a spaceship made of glass, its shiny, in dimensions I’ve never seen before, 3D and it’s coming down towards me. It opens up like a flower from the bottom of the spaceship, there are blue lights. They pull me up. She becomes emotional again. This androgynous being researches and helps most of its time. It then turns white everywhere and feels really good, this scene has transitioned into being with the light and reviewing what had happened in the life before. I asked what was the learning? The Subconscious spoke through her and offered further information about the learnings from the experience: Fire: Represented that she feels so angry sometimes. Water / Cloud / elements: “She can be part of everything. She can take something from each of those to help her. She needs to let go to feel connected to the natural world. Everything happens as its meant to happen, the cycle, she doesn’t need to worry. Everything is how it is meant to be. She knows.” Alien: ‘She has the ability now to heal. She always had that, she can start now. Just let go. She knows she’s powerful.” White Light: “She was with the Angels. 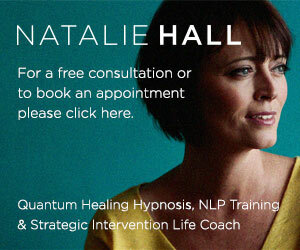 Quantum Healing Hypnosis with Past Life Regression appointments are available in Bournemouth, Dorset.